Cuba (#215771) (1897-1923), 308-foot German-built steel hulled steam-liner owned by the Pacific Mail Steamship Company. 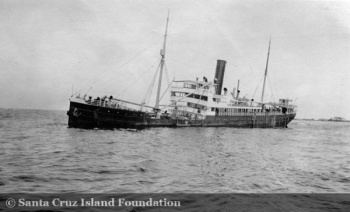 She ran aground on a reef 500 yards from Point Bennett on San Miguel Island on September 8, 1923 under the command of Captain Charles J. Holland. Her 115 passengers and 65 crew were rescued, along with the $2,500,000 in gold and silver bullion she carried. She was headed north to San Francisco when she became stranded in the fog. Captain Ira Eaton, who was running a resort on Santa Cruz Island at the time, salvaged much of the ship’s furnishings, including tables, linens and silverware. He returned to postal authorities the more than 500 letters he found aboard. It was widely reported that Eaton had armed men fending off other would-be salvagers. Cuba’s insurance agent, Lloyd’s of London, eventually sold the salvage rights to Eaton for $800. Today, prominent pieces of the Cuba are still in place where she wrecked at Point Bennett. It is interesting to note the Cuba was wrecked within hours of the tragedy at Honda, when seven battle-ready U.S. Navy destroyers ran aground on the adjacent mainland coast. Distress signals from both of these disasters cluttered the radio airwaves September 8, 1923. [Eaton 1980: 229-233]. 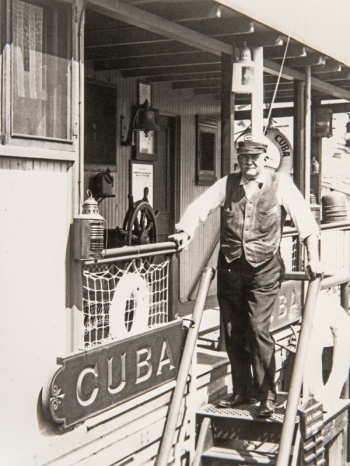 Many artifacts from the Cuba, including her safe, are on display at the Santa Barbara Maritime Museum, donated by Betsy Lester, daughter of Herbert Lester. The Lester family lived on San Miguel Island in the 1930s. "U.S.S. Reno has picked up survivors of the steamship Cuba, which went on San Miguel Island this morning. The Reno is now proceeding to the scene of the wreck to pick up any remaining survivors and will continue to San Diego to land them." This page was last edited on 22 October 2018, at 18:51.